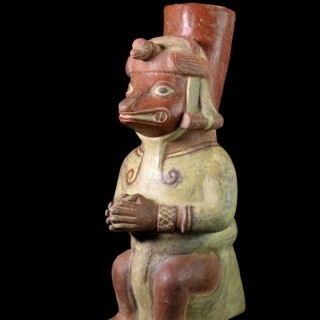 An unusually large and important terracotta vessel depicting a seated person, who has his hands folded on his chest in a gesture of adoration. He is dressed in a yellow tunic, and has a band on his head with the representation of a bird. 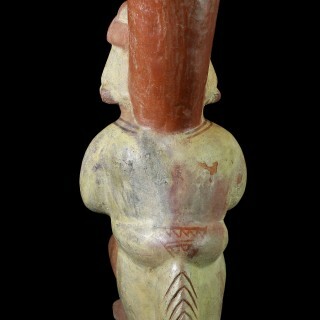 Interestingly, the figure is partly human and partly a fox (as witnessed by the tail of the animal as well as its face). 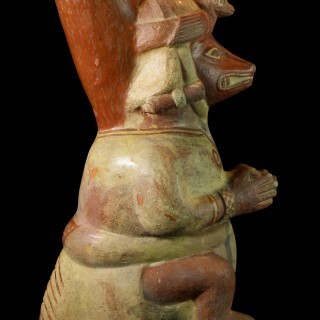 Foxes are often depicted in Moche art as warriors, possibly because of their behaviour in nature, where they hunt and capture small prey; similarly warriors would fight and capture prisoners. Foxes were also associated with the world of the dead, as they are nocturnal animals and live in underground burrows. 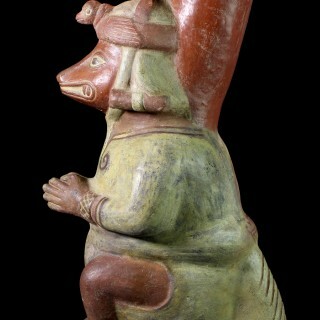 As a result, the fox was an important deity in the Moche pantheon. Moche shamans often consumed the hallucinogenic San Pedro cactus, trying to reach the spiritual world. They believed that during this process they would transform into animal spirit helpers such as the fox. 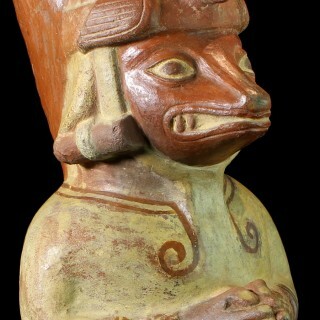 Although of course it is possible that this vessel is a representation of a shaman during a ceremony dedicated to the fox god, in which he is wearing attributes evoking the fox, it is more likely that the vessel shows the gradual transformation of a shaman into a fox; compare also the wide open eyes and large pupils, often considered an indication that the person depicted has been using some hallucinogen (or more correctly entheogen). “Normal” experiences, basic to human existence, can be called into question by going into other modes of perception, such as trance consciousness. During trances, the corporeal is reported to fall away, and gravity’s weight is replaced by a feeling of soaring flight. Plants, animals, and humans merge and exchange identities. 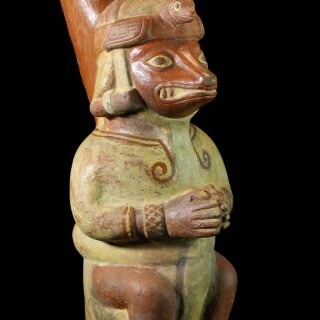 Through trances, shamans feel they directly communicate with spirits and often transform into other beings to acquire esoteric knowledge, songs, and information about herbal cures, the future, and distant situations. The object has been TL tested. 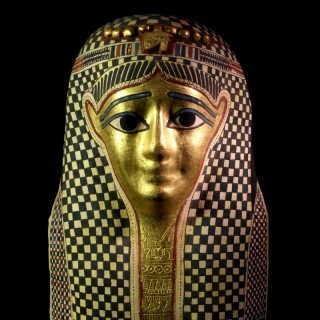 A copy of the test report, confirming its ancient authenticity, will accompany the object. 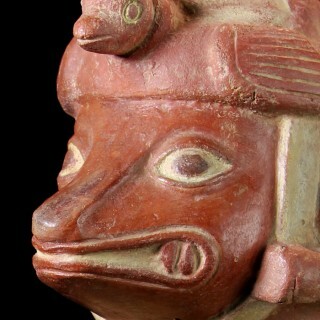 Dating: Moche III-IV, circa 300 – 600 C.E. French private collection; with Christie’s Paris, 2003; German private collection since at least the mid 1970s. A few small hairline fissures, some of them closed, and two small holes, else in excellent condition with a scene of marvellous quality and a wonderful patina.